Help co-curate an exhibit marking this watershed year. Contact Jeff Hughes by May 11 if you have items to fit the exhibition. 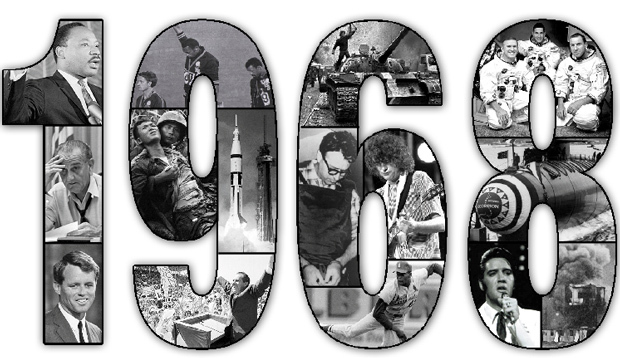 1968 has been called a “watershed year,” amongst many other descriptors, as one of the most significant and tumultuous years of the 20th century. Webster University's Cecille R. Hunt Gallery will present an exhibition commemorating the 50th anniversary of that tumultuous year with a few selected works created in 1968 by Eva Hesse, Robert Rauschenberg, Richard Serra, and others. In addition, there is a chance for the entire Webster University community to help in the exhibition's creation: following the success of Hunt Gallery’s the Neighborhood’s Choice exhibition in 2016, and in keeping with the spirit of 1968 - Hunt Gallery director Jeff Hughes invites community members to become co-curators by choosing and loaning an item from your collection pertinent to the exhibition concept. "This could be anything from high art to late 1960s ephemera," Hughes writes. "For examples, does anyone have ticket stubs or memorabilia from the 1968 World Series (yes, I know what happened to the Cards)? or original numbered White Album (we have insurance)? Psychedelic, music, political posters? or period clothes? or significant books, original Whole Earth Catalogue? or presidential campaign buttons, signs, etc (even if it’s for the guy who won)? . . .
Feel free to invite others, friends, neighbors, parents who also might have art or collectibles that would fit the exhibition. Contact Jeff Hughes by email or phone (314-968-7159) by May 11 if you have items to suggest for inclusion.